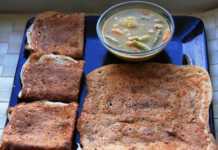 My grandmother used to prepare this moong dal dosa with raw rice and it was my favorite. I substitute the rice with either cracked wheat or corn grits and it tastes equally good and is healthy too. Technically this is adai I guess because it uses spices, coconut, lentils and not urad daal. Also the batter does not require fermentation. 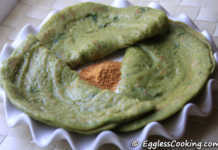 Since the batter has to be in the consistency of dosa batter, very smooth and thin, it qualifies for dosa. 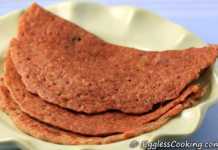 You would be surprised that these dosas doesn’t taste anything like wheat. Nobody can guess it’s made of cracked wheat. 4 Hrs 30 Mins 12 Medium Size Dosas. 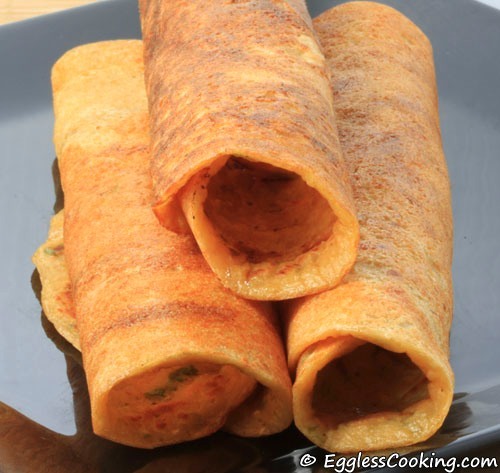 These paper thin savory crepes are made with cracked wheat and moong dal and the batter does not need fermentation. Soak the cracked wheat in 1 cup water. Soak the daals and chilies together in another bowl with 1 and 1/2 cups water. I used the fine variety of cracked wheat. It had the texture of semolina. If you happen to have only the coarse variety run it in a blender/processor for a couple minutes before soaking. Soak everything for at least 3-4 hours. Drain the dal in a colander and reserve the water. Blend together the daals and chilies with some of the reserved water until smooth. Then add the soaked cracked wheat, coconut, ginger, tomato puree. Add water as needed to get a smooth batter. Transfer the batter to a bowl, add salt and mix well. The batter is ready to make the dosas. No need to ferment it. Heat a tava. Sprinkle some water to check if the tava is hot enough. Take the batter in a ladle and pour it on the pan and spread it into a thin circle with the back of the ladle. It takes about 2 minutes for the batter to cook. If you want it crisp you can wait for another minute or until you see a reddish thin crust in the middle. You could either use little oil to top the dosa or use a non stick spray like Pam and spray it lightly in a circular motion on top of the dosa. Using the non stick spray effectively requires some practice. You have to press the nozzle with very light pressure, otherwise there’s going to be an “oil rain” on the dosa. Since the batter is thin, unlike the regular adai batter this one cooks well even without oil. Flip it and cook the other side for another minute. Turn it over once again and roll it just like shown in the picture or serve it as it is. You could use 3/4 cup of moong dal itself instead of 1/2 cup moong dal and 1/4 cup masoor daal. I usually do it like that but this time changed it a little bit. The tomato puree in the batter is optional. I got this idea from another blogger Ashwini. I usually prepare this adai without tomato and that’s good too. But the tomato makes it little tangy and also gives a nice color to the dosa. You could use one small tomato chopped instead of the puree. If adding chopped tomatoes grind it together with the daals itself, otherwise it may not blend properly. This dosa is good either soft or crispy. If you want it soft take it a minute early. Thank you for another wonderful flourless crepe recipe, that uses whole foods! Can a person use another grain besides the cracked wheat in this recipe? Great recipe, I thoroughly enjoy and will make again and again! Loved the nutty flavour the cracked wheat gives it. I’m on a low fat diet so substituted green onion for the coconut. Just wondering if the nutrition facts are available for this recipe? Thanks Patsy. I don’t have the nutritional info. You should try plugging the recipe in some of the online tools available to get the info. Thanks for trying it Viji. i am a beginner in cooking idlis and dosas… how long do I soak the wheat and daal for ? Hi Ruth, I’m sorry I couldn’t get back to you immediately. Soaking the rice for 4-5 hours and urad daal for 1/2 hour is enough for preparing idli batter. For dosa you would be soaking both rice and daal together, so 4-5 hours should be fine. can the dough be refridgerated for a week? I don’t think it will be nice. I’m guessing it will become sour. Usually adai batters are best when used fresh. I’m not sure about it Shina. But I think it should work fine, since it also wheat but cooked and dried. I tried this today but with a slight variation used couscous since I did not have cracked wheat and added one green tomato for a tangy taste.Thanks for posting a healthy version of a dosa. Couscous! that’s really an interesting idea Priya. The taste was amazing. I was able to make it finally – I used toor dal in place of red lentils just because I didn’t have them. Also instead of the tomato paste, I put a whole tomato and blended it together to make a smooth batter. My family loved it and I know that I will be making this again and again. Thank you very much. I’m so glad that you tried it and liked it Gita. Thank you for the feedback. lovely pic..looks yummy n mouthwatering ! !